Oh, the wonder of Christmas. Christmas has always been one of our favorite times of the year. For many years our family celebrated Christmas as non-believers. We did all the normal traditions but left Jesus out because we didn’t know Him. When my husband and I came to know Jesus Christ as our Lord and Savior that changed how we viewed Christmas. Christmas has now become a joyous celebration with a purpose. It is a time of worship and giving thanks to the One who has granted us eternal life. We still celebrated many of the same family traditions we loved but now we had a whole different reason to be celebrating. We tweaked some traditions, changed some and started some new ones. I have always had a mindset of, the simpler the tradition; the more likely it will be carried out. There are so many ways to celebrate this season to keep the focus on Christ. 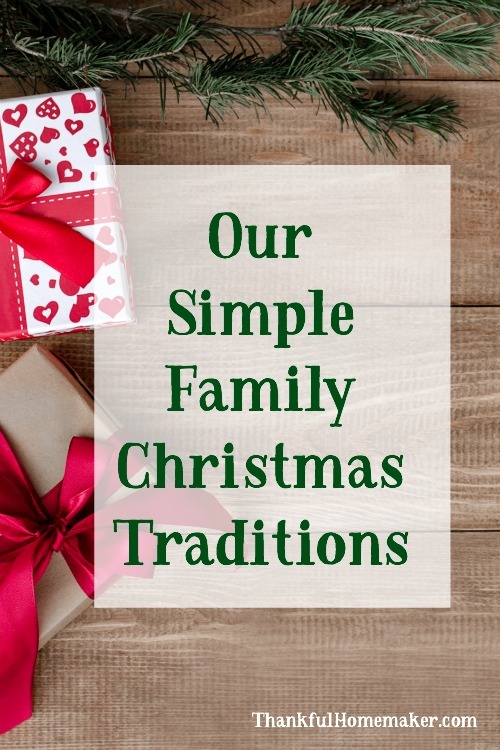 I want to share some of these simple traditions our family adapted that pointed us to the Lord and have become loved and cherished memories we now have together and now continue to have with our grandchildren. Preparing our hearts by reading an Advent book together in the evenings leading up to Christmas was a tradition we all looked forward too. Many years we would just read through the scriptures and have a time of prayer together. When our children were young, we read more family and children-focused advent books. As our family aged together, we would read more adult-focused advent devotionals. 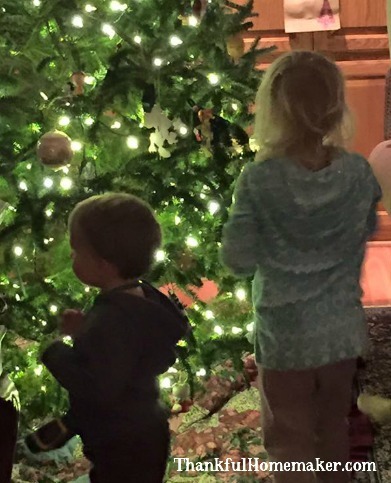 Decorating the tree together as a family continues to be a favorite tradition and now carries on with the grandbabies. We play music, eat not good for us cookies ;), and just enjoy the memories of the ornaments gathered over the years. Two of my grandbabies helping decorate the tree this year. I have a basket set up of favorite Christmas stories and a basket with favorite Christmas movies. We watch the same movies every year and add new ones to the collection as they come out. The Nativity Story has been a recent favorite to watch every Christmas. Our kids looked forward to this time of year because those would now become the bedtime stories and the movie night choices. Peace: Classic Readings for Christmas by Stephen Nichols is one we have picked up time and again. It is a beautiful keepsake book that will draw your heart continually back to the meaning, purpose, and significance of Christmas. Music is always on in our home and this season brings so many favorites. We used to have CD’s playing in the background throughout the day but now it has turned to playlists on Spotify through a Bluetooth speaker. We select Christ focused carols and songs to keep our hearts singing to the Lord throughout the season. Although, I do love so many of the traditional Christmas songs too – the Carpenters Christmas CD is on repeat here quite frequently. We eat our special dinner on Christmas Eve together. I have kept the same food that was a tradition from my childhood on the menu. We try to invite someone from our church family who will be alone on Christmas to join us for the meal. Our daughter and her family along with my father-in-love stay overnight so we can just enjoy being together (even though they all only live 20 minutes away). 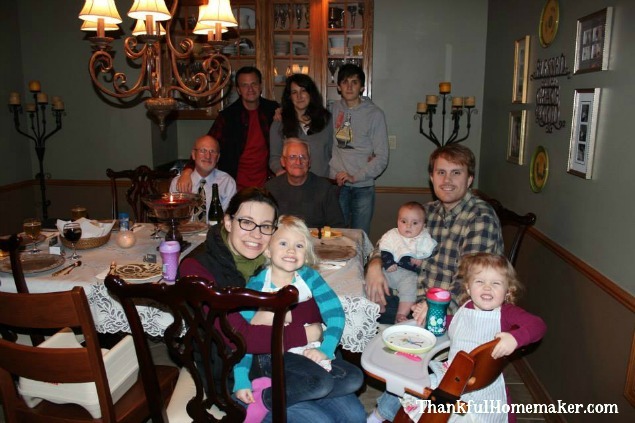 Christmas Eve Dinner last year with our dear friend Grandpa Bob spending the evening with us. Christmas morning brings a reading of the birth of Christ from Luke 2 and a time to go around the breakfast table and share how the Lord has blessed us over the past year. It has become such a sweet time to share and reflect and pray together as a family on the Lord’s goodness and love to us. 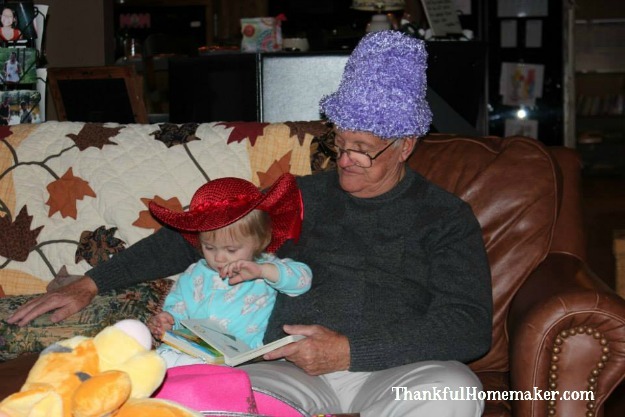 Our sweet Olivia with her Great-Grandpa. Grandpa loves those babies xoxo. We have had many other traditions that have come and gone but these simple ones we have held on to because they are ones we love. They are ones we have come to cherish and look forward to as a family. Whatever traditions your family chooses the hope, as a Christian, is to point our hearts and the hearts of our children to Christ. What are some of your favorite Christmas traditions that you enjoy as a family?